From the Hancock County Courthouse, go north on Hwy 15 for 12.8 miles. Turn right on Mt. Stephens / Edwards Rd. Go 2.2 miles to Mt. Stephens Church on your right. The cemetery is behind the church. "I pray Thee Lord my soul to keep"
Empty-appearing lot. "Morgan" on coping. m. Sept. 6, 1951 to Louise Y. Edwards. No death date. m. Sept. 6, 1951 to Charlie A. Edwards. On same gravestone as Esther I. Edwards. On same gravestone as Carl Edwards, Sr.
On same gravestone as Marjorie A. Barnes. No death date. On same gravestone as H. Dorsey Barnes. "Beloved mother of Cecil, Larry, Annette"
On same gravestone as Ruth M. Edwards. 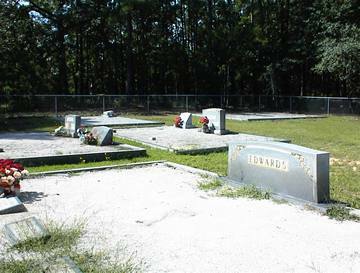 No death date as of September 2002. On same gravestone as Austin Perry Edwards. On same gravestone as Loy E. Lacey. On same gravestone as John W. Lacey. No death date as of September 2002. Empty-appearing lot. Edwards on coping.